Last year at Dice Hate Me headquarters, we received a review copy of a very unassuming little card game called Launch Pad. The box exterior seemed innocuous enough, but once we cracked the seal and started to play, we soon realized that this little card game was anything but innocent – this was filled with more punk factor than Monopoly Deal and Bang! combined. Of course, that meant that we liked it. 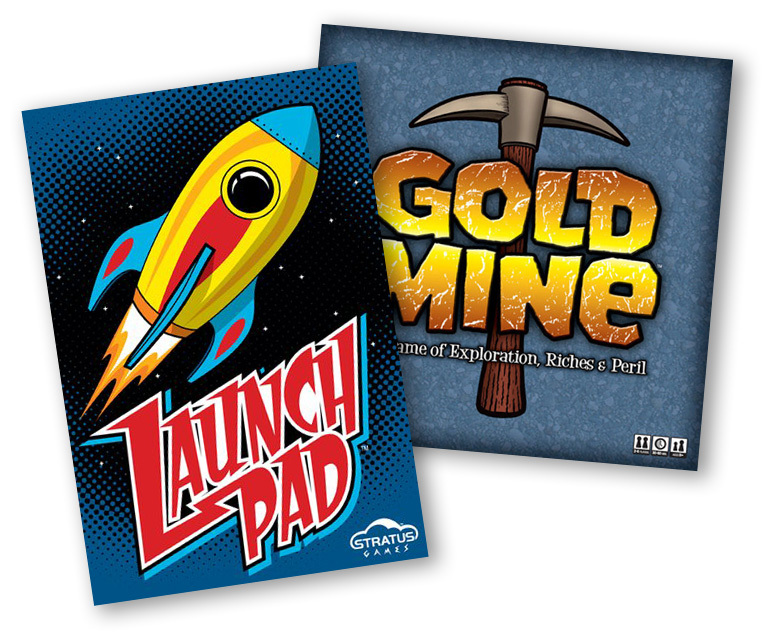 As a result, I’ve kept a close eye on the developments at Stratus Games – the makers of Launch Pad, Gold Mine and the upcoming Eruption – and I figured it was just about time to talk to Chris James and share the full Dice Hate Me treatment. When did you start Stratus Games? How did the company come about? We started Stratus Games in September of 2009 with a couple of rough game prototypes and a lot of work ahead of us. Melanie and I are a husband and wife team that have always enjoyed board games on a casual level. We love playing games together, with family, and with friends, as they offer a great way to open up and enjoy some face-to-face fun (and sometimes backstabbing). For many years, we had been toying with the idea of starting a business that would allow us to spend more time together and work on creative projects together. When we finally brought up the possibility of game design and publication, it seemed like a long shot, but we decided to explore it further. Within hours, Melanie had come up with the nearly-complete Launch Pad concept and after a few days and some tinkering, Gold Mine was in its initial stages. After awhile, we started to playtest our games with others and they were received very well. During this time, we somehow decided to dive in all the way, despite all of the challenges and obstacles that lay ahead of us, including the logistics of the business, the amount of competition, and our inexperience in the industry. So far, so good. 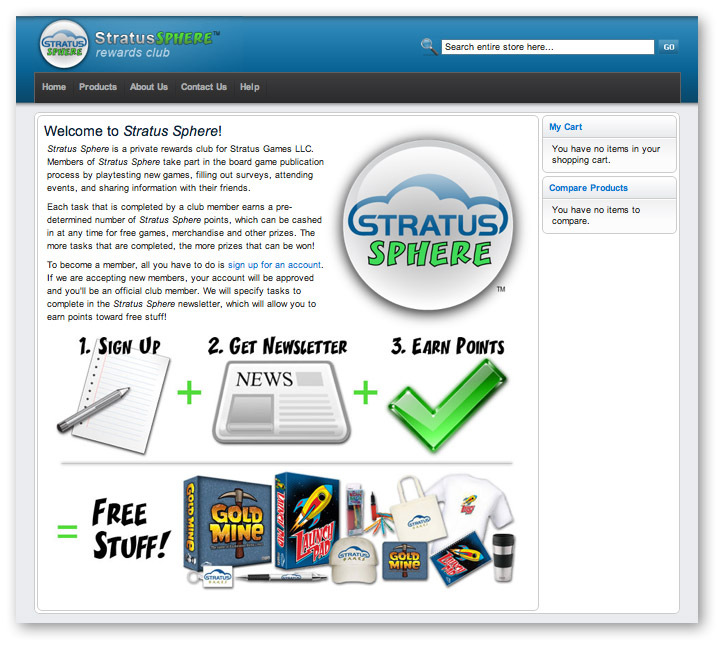 The Stratus Sphere club is an interesting concept; in exchange for helping with playtesting an upcoming game or spreading the news of Stratus Games, members earn points that can be exchanged for goodies and games in the Stratus Sphere store. How did you come up with the concept behind Stratus Sphere? How influential has it become for your company and for game development? During the summer of 2010, we identified the need to expand our playtesting group to a wider and more diverse audience, collect more objective feedback, track and reward the most helpful contributors to our company, and free up some of our time spent on playtesting. After identifying our objectives, we came up with the Stratus Sphere club as a collective solution to these needs. We embraced some great technology to introduce a storefront for cataloguing prizes, tracking reward points, managing newsletters, and handling prize orders. We also staged a survey system to help us receive and analyze feedback from the members of Stratus Sphere. We tested the Stratus Sphere concept with member feedback from start to finish on our latest game, Eruption. We found the system to be very successful in meeting our objectives. We received very good feedback, tested the game more thoroughly and by a more diverse audience than ever before, and discovered new channels and opportunities that we would have missed out on otherwise. We are currently ramping up on the testing of new games and are working on expanding our club membership significantly. Anyone in the United States who wishes to take part in our game development process is encouraged to join. 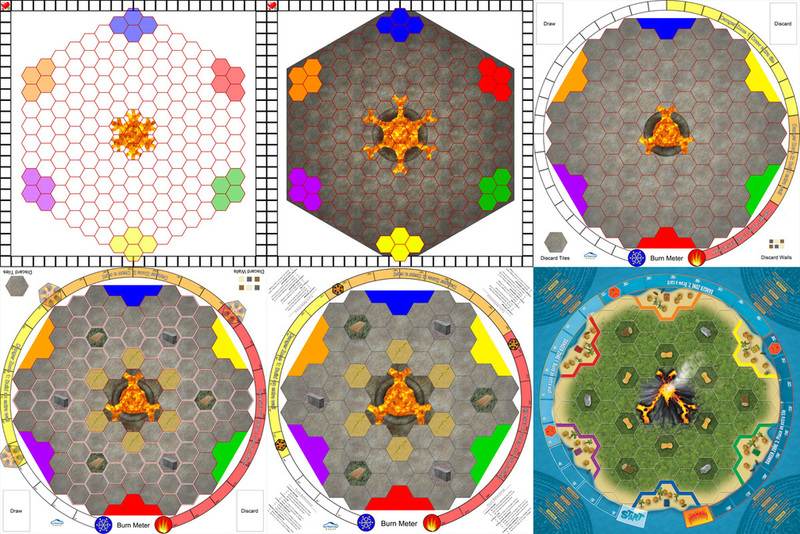 One of the great things on the Stratus Games website is the variant rules for all the games. Are some of the variants sent in by fans? What is one of your favorites? From the beginning, we have been dedicated to providing high value for our customers. The inclusion of variants (officially titled “Optional Rules” on the website and in the instruction booklets) is part of this effort. We consider our Optional Rules to be “free expansions” to each game to provide long term play appeal. Gold Mine, in particular, was designed as a simple core concept that could easily be expanded upon by adding any combination of Optional Rules into the mix. The result is a game that can be enjoyed by children, families, casual and more experienced gamers, alike, depending on the mix of variants that are used. The Optional Rule system on our website allows any user to submit their own variants and rate any existing ones. While the collection is only in the beginning stages, we have received submissions and hope to receive many more, as we are always encouraging our fans to take part in the process of game development. We have also supplied many of our own “official” variants to supplement the collection. So far, I suppose I’m somewhat partial to the “Phantom of the Mine” and “Special Abilities” variants for Gold Mine. “Gold Mine Solitaire” and “Cursed Pirate Gold” have also earned my stamp of approval. All of these have been developed in-house. Your latest game is Eruption, and it looks to be Stratus Games’ biggest yet. Can you tell us a bit about it? 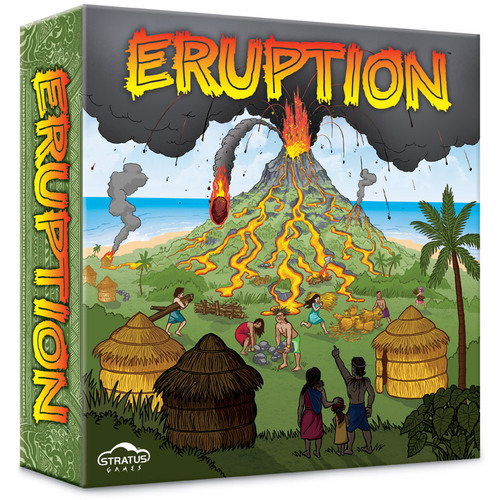 Eruption is a volcano-themed game in which each player defends an island village that is in danger of being destroyed by an erupting volcano. Players place hexagonal tiles to direct the flow of lava from the volcano at the center of the island toward the surrounding villages. Tiles can be placed offensively or defensively, though players are rewarded with action cards when lava makes contact with a village. The action cards allow players to rotate, replace, or remove tiles or fortify their villages in various ways. In addition, players can build walls of various strengths to attempt to hold back the lava from entering their village. As lava enters a village, its temperature increases until it burns up completely, and the player whose village is at the lowest temperature at the end of the game is the winner. Eruption has received very positive feedback from our playtesters and generated quite a bit of excitement. It offers a nice balance of strategy, unpredictability, balanced scores, tough decisions, and back-stabbing competition. We are very excited for its release this October and are hopeful that it will help to establish Stratus Games as a leader in family and gateway game production. Eruption went through a lengthy playtest phase, and we saw quite an evolution in the game and artwork. You recently shared most of the story in a detailed designer diary on BoardGameGeek, but were there any particular phases, mechanics or concepts that were more difficult hurdles than others during the process? Perhaps the most difficult aspect has been finding the right balance for the Burn Meter, which tracks the temperature of each village and offers a built-in balancing mechanism. The Burn Meter is largely responsible for the pace and length of the game, as well as the balance of scores in the end. It has been a challenge to find the right track length and length of each individual Danger Zone, which offers new abilities as players’ villages increase in temperature. We wanted to make the Burn Meter long enough to give a losing player who has been “ganged up” on a chance to come back, yet short enough that there is danger of burning up and ending the game early. While there will always be variables, such as the number of players or the overall offensive and defensive strategies, I believe we have found a balance that will make the game fun to play no matter what. Since the Dice Hate Me review of Launch Pad, we have found ourselves bringing it out of the game closet more than a lot of other games of its weight, and we really enjoy its gleefully malicious gameplay. Does Melanie plan to design any other games for release? As I alluded to earlier, Melanie and I work very closely on all of our projects. The decision as to who is the “official” designer comes down to who came up with the original concept and, therefore, makes final decisions on the game design. We could possibly put both of our names on any of our games, but we choose to keep it to one for simplicity. That being said, Melanie’s sudden stroke of inspiration for Launch Pad was quite impressive, and I’m sure there will be many others. She has a few projects on the back burner that she will likely resume at some point, once she has the time. Being six months pregnant with our first little “playtester” has caused her to reprioritize her time a bit. What other games does Stratus Games currently have in development? Can we get any sneak peeks? We’re working on ramping up testing of a light dice game involving tile placement, wagering, and some bluffing. We also have a cannon-themed game in the works that was initially developed in parallel with Eruption that I am excited to revisit soon. More details will be provided to Stratus Sphere members in the coming weeks and months. We’ll leave it at that for now. 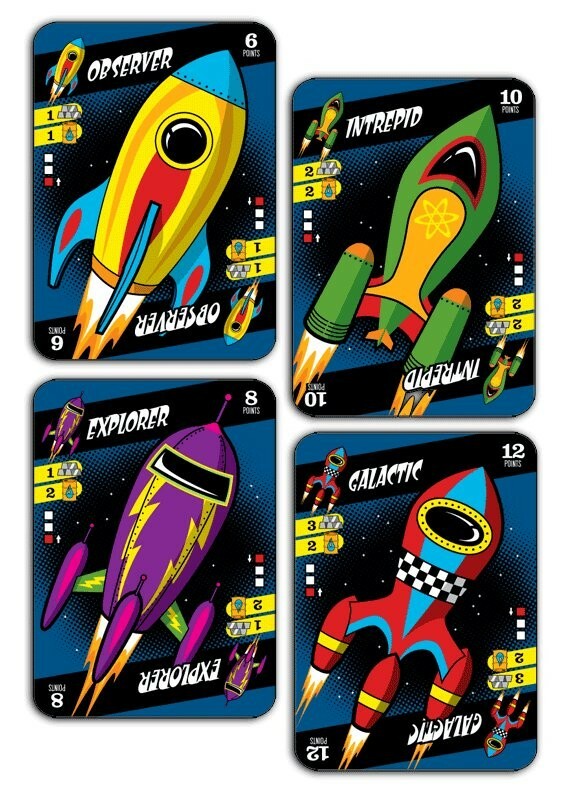 Does Stratus Games have any plans to accept submissions from other designers? Yes, we will likely open to submissions at some point in the future. While game development is the most enjoyable aspect of our work, it is also very time consuming. We have lots of creative ideas flowing that we will be working on over the coming months and years, but once our company has grown to the point that we have the capital to move forward with new games faster than we have the ability to design them ourselves, we will begin to accept and evaluate submissions. The best way for one to help us reach that point is to spread the word about our company and products, purchase preorder packages, and get involved with Stratus Sphere. What are some of your favorite games to play? Are there any that have directly influenced your game designs? I am typically a fan of lighter family and gateway type games than heavier strategy games. I like games that encourage social interaction rather than just a lot of thinking. I, like many others, played Survive! in my childhood, which made a lasting impression on me. I also confess that my interest in Carcassonne influenced the tile-laying aspect of Gold Mine, which served as the starting point of the design. Do you plan to attend any game conventions this year? We exhibited at the GAMA Trade Show in March, which turned out very well. We will also likely attend the RinCon convention here in Tucson. Unfortunately, we will not have the opportunity to personally attend the major consumer shows this year, such as Origins and GenCon, due to our current schedule and the arrival of our baby in September. However, we are hoping to find some kind Stratus Sphere members who are willing to demo our products at these shows. So far, Stratus Sphere has allowed us to gain some level of representation at the National Eurogame Championships that took place in May and the upcoming World Boardgaming Championships in August. Through other volunteers, our games will also be demoed this month at the Comic Con in Paris. We would like to thank Chris James for taking the time to run the gauntlet. Their latest release, Eruption, is available for pre-order, so you should grab your copy before they’ve all abandoned the island! And be sure to watch Dice Hate Me this summer, as we’re brewing up a special giveaway courtesy of Stratus Games! always glad to read these kinds of stories.. the games look great and seem like very nice people .. I wish them all success.. another great read Chris ! Cool insight on designer. Will there be a more indepth look at the gameplay for Eruption? PK – Thanks! Chris has always been very gracious. I look forward to more from him and Melanie. DevilDawg – Thanks, I hope to have more on Eruption as its release date draws nearer. Keep your eyes peeled!